Mitsubishi Chemical Advanced Materials® PPSU polyphenylsulfone (PPSU) is an amorphous high performance thermoplastic offering better impact resistance and chemical resistance than polysulfone and polyetherimide (Duratron® PEI) as with Figures 15 and 16. Mitsubishi Chemical Advanced Materials PPSU offers superior hydrolysis resistance when compared to other amorphous thermoplastics as measured by steam autoclaving cycles to failure. In fact, Mitsubishi Chemical Advanced Materials PPSU has virtually unlimited steam sterilizability (See Table 3). This factor makes it an excellent choice for medical devices as steam autoclaves are widely used to sterilize medical devices. It also resists common acids and bases — including commercial washing solutions — over a broad temperature range. Mitsubishi Chemical Advanced Materials PPSU is stocked in natural (bone white) and available in transparent and custom colors. It is commonly used in sterilization trays, dental and surgical instrument handles, and in fluid handling coupling and fitting applications. Mitsubishi Chemical Advanced Materials PPSU is USP Class VI compliant. It is suitable for use in electronic assembly equipment and devices that must withstand solder temperatures. 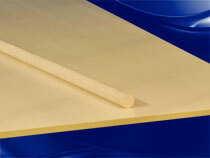 Mitsubishi Chemical Advanced Materials PPSU has a heat deflection temperature of 405®F (207®C). Mitsubishi Chemical Advanced Materials® PPSU LSG stock shapes are produced from selected batches of a specific Radel R polyphenylsulfone resin. This material offers a better impact strength and chemical resistance than Duratron® LSG PEI and PSU LSG and it also has superior hydrolysis resistance as measured by steam autoclaving cycles to failure. The composition of the resin used for the production of the Mitsubishi Chemical Advanced Materials PPSU LSG stock shapes complies with the regulations that apply in the Member States of the European Union (Directive 2002/72/EC, as amended) and in the United States of America (FDA) for plastic materials and articles intended to come into contact with foodstuffs. Mitsubishi Chemical Advanced Materials PPSU LSG stock shapes have also been successfully type tested for their compliance with both United States Pharmacopeia (USP) and ISO 10993-1 guideline requirements for Biocompatibility Testing of Materials, and they come with full traceability from resin to stock shape. These features, added to an excellent sterilizability by means of steam, dry heat, ethylene oxide, plasma and gamma irradiation, make Mitsubishi Chemical Advanced Materials PPSU LSG stock shapes very suitable for applications in the medical, pharmaceutical and biotechnology markets. Radel is not a wear material, and its properties degrade when exposed to sunlight.